From Weigall's The Glory of the Pharaohs, (London, 1923,) pp. 127-130. (Thames and Hudson, 1996,) 73. "...In the Valley of the Tombs of the Kings at Thebes excavations were conducted for some years at the expense of Mr. Theodore M. Davis, of Newport, Rhode Island, by special arrangement with the Department of Antiquities of the Egyptian Government; and as the representative of that Department I had to supervise the work. 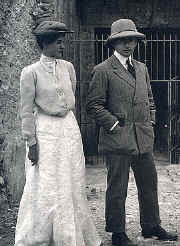 The finding of the tomb of Yuaa and Tuau during these excavations was an event only eclipsed by Lord Carnarvon's recent discovery, and one which came somewhere near to the standard of romance set by the novelists. Yuaa and Tuau were the parents of Queen Tiy...When the entrance of their tomb was cleared, a flight of steps was exposed, leading down to a passage blocked by a wall of loose stones. In the top right hand corner a small hole, large enough to admit a man, had been made in ancient times, and through this we could look down into a dark passage. As it was too late in the day to enter at once, we postponed that exciting experience until the morrow, and some police were sent for to guard the entrance during the night. I had slept the previous night over the mouth, and there was now no possibility of leaving the place for several more nights, so a rough camp was formed on the spot. "Here I settled myself down for the long watch, and speculated on the events of the next morning, when Mr. Davis and one or two well known Egyptologists were to come to the valley to be present at the opening of the sepulcher. Presently, in the silent darkness, a slight noise was heard on the hillside, and immediately the challenge of the sentry rang out. This was answered by a distant call, and after some moments of alertness on our part we observed two figures approaching us. These, to my surprise, proved to be a well-known American artist and his wife [Mr. and Mrs. Joseph Lindon Smith], who had obviously come on the expectation that trouble was ahead; but though in this they were destined to suffer disappointment, still, out of respect for the absolute unconcern of both visitors, it may be mentioned that the mouth of a lonely tomb already said by native rumour to contain incalculable wealth is not perhaps the safest place in the world. Here, then, on a level patch of rock we three lay down and slept fitfully until the dawn. Soon after breakfast the wall at the mouth of the tomb was pulled down, and the party passed into the low passage which sloped down to the burial chamber. At the bottom of this passage there was a second wall blocking the way; but when a few layers had been taken off the top we were able to climb, one by one, into the chamber. "Imagine entering a townhouse which had been closed for the summer; imagine the stuffy room, he stiff, silent appearance of the furniture, the feeling that some ghostly occupants of the vacant chairs have just been disturbed, the desire to throw open the windows to let life into the room once more. That was perhaps the first sensation as we stood, really dumbfounded, and stared around at the relics of the life of over three thousand years ago, all of which were as new almost as when they graced the palace of Prince Yuaa. Three arm-chairs were perhaps the first objects to attract the attention: beautiful carved wooden chairs, decorated with gold. Belonging to one of these was a pillow made of down and covered with linen. It was so perfectly preserved that one might have sat upon it or tossed it from this chair to that without doing it injury. Here were fine alabaster vases, and in one of these we were startled to find a liquid, like honey or syrup, still unsolidified by time. Boxes of exquisite workmanship stood in various parts of the room, some resting on delicately wrought legs. Now the eye was directed to a wicker trunk fitted with trays and partitions, and ventilated with little apertures, since the scents were doubtless strong. Two most comfortable beds were to be observed, fitted with springy string mattresses and decorated with charming designs in gold. There in the far corner, placed upon the top of a number of large white jars, stood the light chariot which Yuaa had owned in his lifetime. In all directions stood objects gleaming with gold undulled by a speck of dust, and one looked from one article to another with the feeling that the entire human conception of Time was wrong. These were the things of yesterday, of a year or so ago. Why, here were the meats prepared for the feasts in the Underworld; here were Yuaa's favorite joints, each neatly placed in a wooden box as though for a journey. Here was his staff, and here were his sandals--a new pair and an old. In another corner there stood the magical figures by the power of which the prince was to make his way through Hades. The words of the mystical "Chapter of the Flame" and of the "Chapter of the Magical Figure of the North Wall" were inscribed upon them; and upon a great roll of papyrus twenty-two yards in length other efficacious prayers were written. "But though the eyes passed from object to object, they ever returned to the two lidless gilded coffins in which the owners of this room of the dead lay as though peacefully sleeping. First above Yuaa and then above his wife the electric lamps were held, and as one looked down into their quiet faces (from which the bandages had been removed by some ancient robber), there was almost the feeling that they would presently open their eyes and blink at the light. The stern features of the old man commanded one's attention, and again and again our gaze was turned from this mass of wealth to this sleeping figure in whose honour it had been placed here. "At last we returned to the surface to allow the thoughts opportunity to collect themselves and the pulses time to quiet down, for, even to the most unemotional, a discovery of this kind, bringing one into the very presence of the past, has really an unsteadying effect. Then once more we descended, and made the preliminary arrangements for the cataloguing of the antiquities. It was now that the real work began, and, once the excitement was passed, there was a monotony of labour to be faced which put a very considerable strain on the powers of all concerned. The hot days when one sweated over the heavy packing-cases, and the bitterly cold nights when one lay at the mouth of the tomb under the stars, dragged on for many a week; and when at last the long train of boxes was carried down the Nile en route for the Cairo Museum, it was with a sigh of relief that I returned to my regular work." Commentary by William Max Miller, M. A. "Behind the first barrier of cliffs and hills there was a wild and desolate valley, where once some prehistoric torrent had rushed down from the heights of the Sahara. If a man climbed by a jackal track over the cliffs which faced Thebes he could drop down into this silent ravine on the other side: it was just like scrambling over a huge wall. Or, by going northwards for a mile or two, he could enter the valley at its insignificant mouth and follow its winding, pathless course, scrambling over boulders and up the smooth rocks of forgotten waterfalls until he was completely shut in by the towering cliffs or rugged hillslopes which echoed to his footfall. The ravine ended in a cul-de-sac, a magnificent amphitheatre surrounded by precipices or steep hillsides, dominated to the south by a mountain which rose against the blue sky like a mighty pyramid. "There was not a blade of grass nor a trace of scrub in this desert valley. The sun beat down on its lifeless rocks all through the morning, and in the afternoon the valley lay in deep shadow, utterly silent except for the sighing of the wind and the occasional cry of a jackal. Although only screened from the teeming life of the Nile valley by a wall of cliffs, it seemed to be infinitely remote and unearthly--a sterile, echoing region of the Underworld or a hollow in the mountains of the moon....."
At the tomb of Yuya and Tuyu, Weigall experienced an almost overwhelming encounter with the distant past, one which sometimes left him shaken. In an interesting article written for KMT, vol. 9, no. 2 (Summer, 1998, pp. 41-45) his granddaughter, Julie Hankey, quotes a letter written by Weigall to his wife in which he describes his sensations on discovering an alabaster jug with still-liquid contents (initially misidentified as honey) remaining inside: "When I saw this I really nearly fainted....The extraordinary sensation of finding oneself looking at a pot of honey as liquid and sticky as the honey one eats for breakfast and yet three thousand five hundred years old , was so dumbfounding that one felt as though one were mad or dreaming." Weigall was by no means the only member of Davis's party to be so effected. "Maspero, Davis and I stood there gaping and almost trembling for a time," he wrote, describing the men's reactions when they first surveyed the tomb's contents. "...I think we all felt we were face to face with something which seemed to upset all human ideas of time and distance." Later, while studying the withered yet remarkably well-preserved features of the two mummies, an "awful feeling" came over Weigall which must have been psychologically contagious because Maspero and Davis both joined him in making a quick exit from KV 46! Weigall describes emotional reactions even more drastic than his own. When Corinna Smith, artist Lindon Smith's wife, first entered KV 46, the sight of the ancient relics and mummies proved too much for her altogether, and she burst into a crying fit so severe that she had to be taken from the tomb. Even reading about the discovery of Yuya and Tuyu could elicit strange responses! Weigall's lovely wife Hortense wrote to him soon after she'd been informed of the discovery, and described her reactions upon reading his letter about the tomb and its contents: "I felt like someone in a dream and I grew first cold and then hot as I read, and when the letter was finished my cheeks were so crimson that Mamma thought I had fever!...I don't wonder that people fainted and cried!" But it was crusty old Theodore Davis himself who suffered the most severe reaction. Weigall reports that Davis had entered the tomb for another look around. "But he had hardly looked for more than a minute when he cried 'O my God!' and pitched forward in a bad faint." Weigall and Smith rushed to Davis's side and helped him to his feet, only to see the irascible American millionaire faint for a second time. Weigall does not indicate in his letter that medical attention was required for Davis, so it is probably safe to rule out stroke or heart attack as the cause of Davis's collapse in KV 46. Like the others, this sophisticated man-of-the-world was probably just emotionally overwhelmed by the enormity of the discovery. 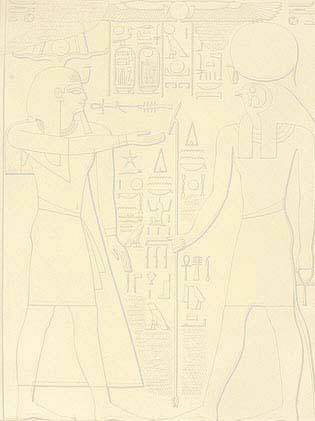 Weigall's letter and other writings show us a side of Egyptology that is almost totally ignored today. The human dimension of our encounter with ancient Egypt can be as interesting as the objects uncovered by the archeologist's spade, and in this respect, Weigall's work retains a special importance.